הירק אף על פי שלקיטתו כאחת אין מכניסו לקיום. והתאנים אף על פי שמכניסן לקיום אין לקיטתן כאחד. Mishna Peah 1:4 states five conditions which have to be true in order for a type of produce to be obligated in Peah. The conditions are that it has to be eatable by people, owned by someone (i.e. not ownerless), rooted in the ground (i.e. not mushrooms), gathered at one time (i.e. ripen simultaneously so that all produce will be gathered together in one shot), and subject to storage (i.e. that they do not rot fast without refrigeration). If any type of produce does not fulfill even one of these conditions it is not obligated in Peah. This Tosefta gives an example of two types of produce which do not fulfill one of these conditions. The Tosefta is not referring to every type of vegetable. It is referring to only leafy green vegetables that grow above ground, wilt away fast and cannot be stored for a significant period of time such as lettuce or parsley, and which therefore are exempt from Peah. However it is not talking about other vegetables that grow below ground and can be stored for a significant period of time such as garlic or onions. Garlic and onions are obligated in Peah, because they fulfill all five conditions listed in the Mishna. Vegetables ripen simultaneously, so there is no situation that some vegetables in the field are ripe and some are not. Therefore they can all be harvested from the field in one shot. Figs do not rot fast if stored properly. They can be dried and preserved for months. 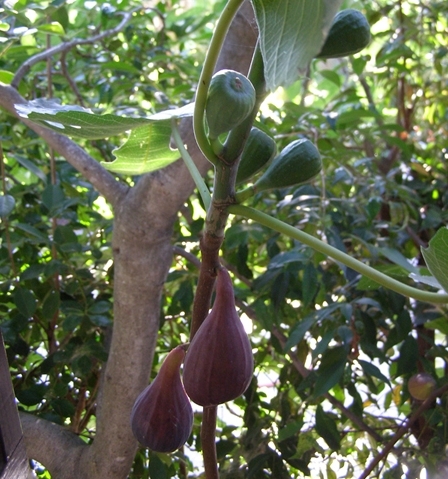 The Common fig (Ficus carica) bears a first crop, called the Breba crop, in the spring on last season’s growth (wood). The second crop is born in the fall on the new growth and is known as the Main crop. This means that figs have two separate harvesting seasons and cannot be harvested in one shot. Therefore figs are exempt from Peah. Figs are unique in this way from other common fruit in the Land of Israel such as grapes, dates, pomegranates, olives and various nuts all of which ripen only one time a year and have a single harvesting season, which makes them obligated in Peah. It is my humble opinion that that the Rishonim (Medieval authorities) did not understand that the Tosefta is referring to this two season behavior of the fig or they simply were not aware of it since the Breba crop is not as plentiful as the Main crop and may have simply been ignored in their time. They thought that the Tosefta simply means that the figs do not all ripen in one day, but rather ripen over a period of a few days. The Rambam (Hilchot Matnot Aniyim 2:2) writes so explicitly. Since what the Rambam writes is true about all fruit and not just figs, the Radvaz in his commentary on the Rambam (ibid.) says that the Tannaim must have made a special rule about figs since most other fruits also ripen over a span of many days, some earlier some later, and yet all of them are obligated in Peah as the Mishna Peah 1:5 explicitly says. However, if they would only realize that the Tosefta is referring to this double season phenomena of the Common fig then they would not have this dilemma. WONDERFUL picture of brebas, which visibly explains also the mystery of Jesus' expectation of figs on a tree near Jerusalem in April. HE was looking for brebas! WHAT WAS THE DAY AND MONTH when this picture taken? WHERE was it taken? This picture was taken at Encanto Farms Nursery in San Diego, CA sometime during 2006-2009 period. I don’t know the exact date.